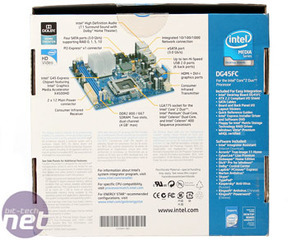 To round up our short mini-ITX season, we've finally got around to reviewing Intel's little blue G45 board. 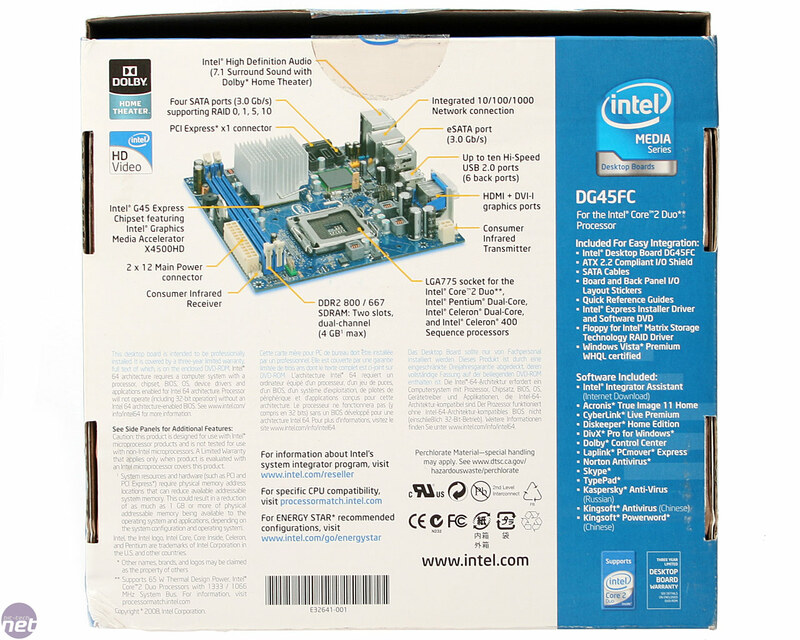 Today we're going to strip it down and get to grips with how it compares to the competition coming from other LGA775 based mini-ITX boards. 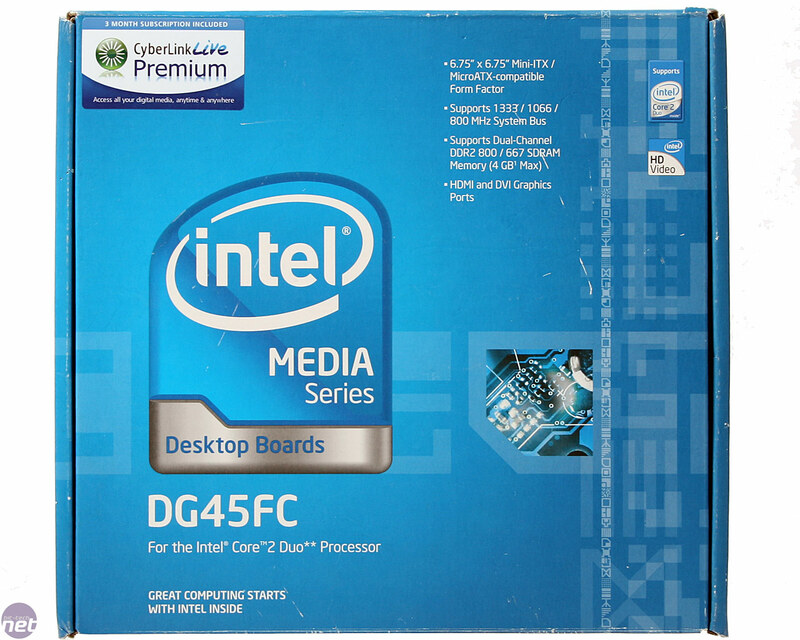 While Intel's G45 maybe continually ribbed for its extremely poor gaming performance, we're reviewing the DG45FC under the HTPC guise, because that's what Intel concentrates its driver development on. At £20 less than the Zotac GeForce 9300-ITX WiFi, is it a better buy or will the more expensive Nvidia solution be a more complete package? 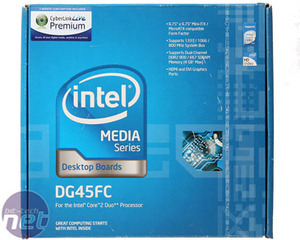 Can Intel design motherboards, as well as it can make chipsets and CPUs? Let's find out. 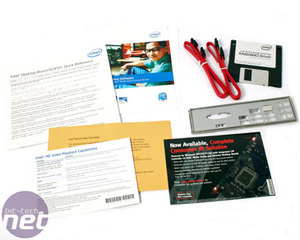 The tiny box is actually quite informative (see the back of it, above) and inside Intel gives about a tree's worth of documentation, instead of just a manual and driver CD (there is one, but not shown). With a couple of SATA cables, a basic, metal rear I/O plate and even a floppy with RAID drivers it's as basic as other mini-ITX products. Since the board has no floppy port though, it leaves this up to USB floppy support which makes us wonder whether it's even worth the bother. 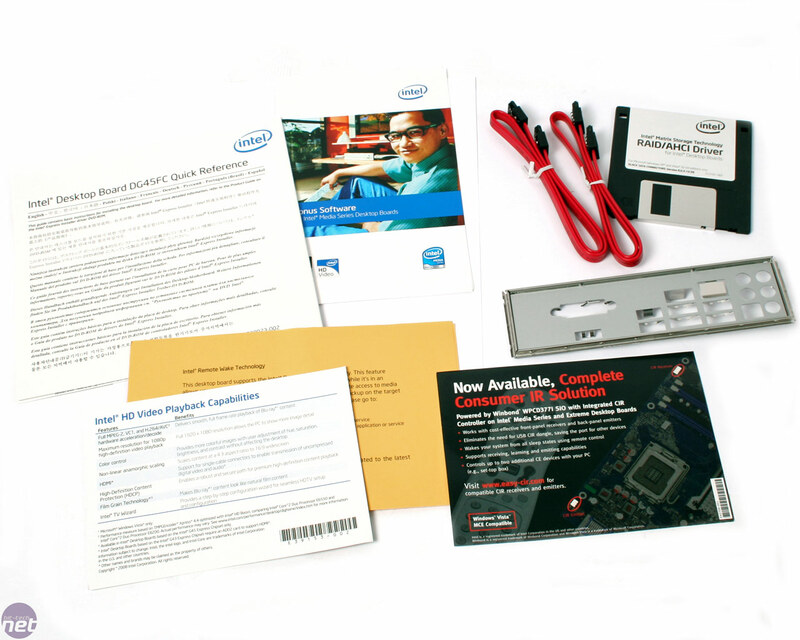 For software, the package includes a three month subscription to Cyberlink Live Premium, although the non-Premium version is available for free for everyone, as well as Acronis True Image 11 Home, Diskeeper Home Edition, DivX Pro, Dolby Control Centre, Laplink PCmover Express and a few other anti-viral bits and bobs, including Norton that no one should ever use. That's a surprisingly good bundle! Especially Acronis True Image and Diskeeper, which we use in the labs all the time.